Honda CB300R has been launched in India at a price of Rs 2.41 Lakhs. It competes with the likes of KTM Duke 390, BMW G 310 R and Royal Enfield 650 Twins. Honda Motorcycles and Scooter India have launched their new premium motorcycle CB300R in India. Currently, it is bought as a CKD unit in India. The neo-sports cafe-racer for India is the same for the global markets, without any changes. CB300R is powered by a 286cc liquid-cooled DOHC single cylinder engine that puts out 32 BHP and 27.5 Nm of peak torque. The engine comes mated to a 6-speed gearbox with a wet, multi-plate clutch. It gets a fuel tank capacity of 10 litres. With an expected mileage of 30 kmpl, it would offer a riding range of 300 kms. 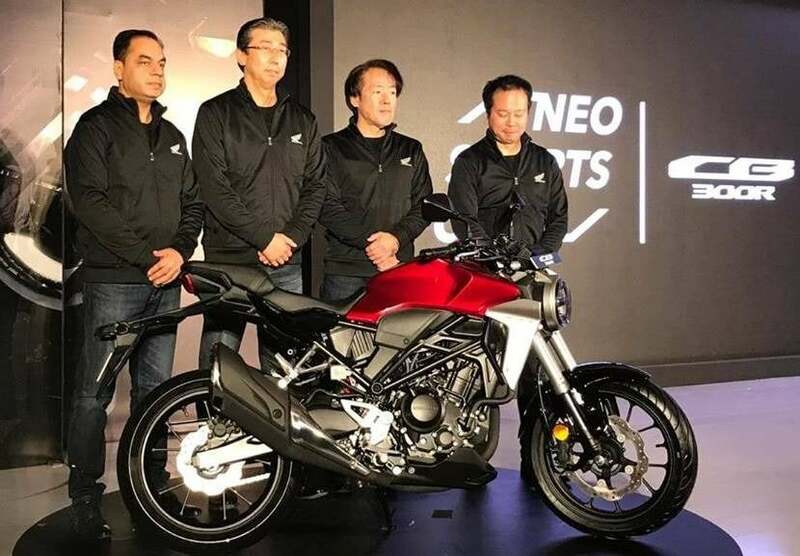 Features onboard include a fully digital instrument cluster, LED headlamps, premium USD forks, low-placed handlebars, split step-up seat, and dual-channel ABS as standard fitment. For suspension purposes, Honda CB300R uses Upside-Down telescopic forks at the front and 5-step adjustable monoshock at the back. The bike uses 296mm disc at the front and 220mm disc at the back with dual-ABS. CB300R is 2028mm long, 888mm wide and 1053mm tall. The ground clearance stands at 151mm and the wheelbase at 1344mm. The bike weighs 147 kgs, which can be considered lightweight. It gets a seat height of 800mm. Honda CB300R is available only in two colour options – Matt Axis Grey Metallic and Candy Chromosphere Red. The bookings for the bike began last month itself. It is only available at 22 Honda Wing World dealerships across the country. Currently, the bike has been booked for the next three months. The deliveries will begin from the third week of March 2019. Honda CB300R adapts the cafe-racer type styling with the modern fits and finishes. The low-end handlebars offer a slightly dedicated riding position, indicating that it still has the cafe-racer traits. Priced at Rs 2.41 Lakhs, it is the entry-level premium motorcycle from HMSI. It is placed above the CBR250R, which is priced at Rs 1.73 Lakhs (ex-showroom prices). Honda CB300R competes with the likes of BMW G 310 R, KTM Duke 390 and Royal Enfield 650 Twins. Duke and Royal Enfield compete with this bike because of its similar pricing range.